I have to admit, I think that this has been my FAVORITE freezer to crockpot recipe yet! And that is saying something if you have noticed the shear amount of of freezer cooking that I have been doing lately! 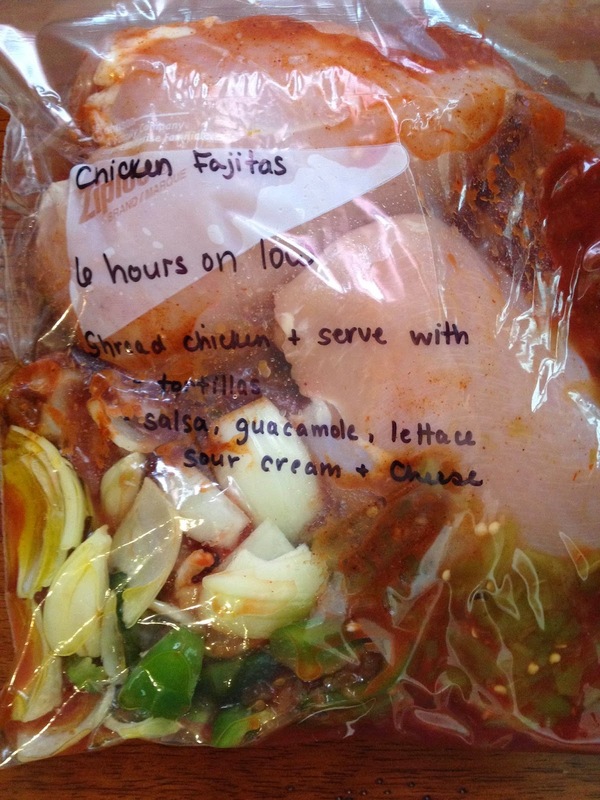 There is just something quite tasty about a Chicken Fajita and cooking it in the crockpot did not disappoint. I found this recipe at Fun With Sharps. Along with our dinner, it also served us leftovers for several lunches. UmUmGood! 1. Label the Freezer Bag with the Instructions. 4. Before eating, shred the chicken meat and add it back to the sauce. I cannot wait to try this one again! My hubs tends to like foods a little spicier that I can handle, but this meal had enough kick to make him happy and was mild enough that I could eat it (I also had avocados on mine, so that may have toned down the spice too). :) I will admit, thinking about this meal is making me hungry again!